2 4 • O U T PA T I E N T S U R G E R Y M A G A Z I N E • O C T O B E R 2 0 1 8 W ho knew dropdown menus and auto-populating fields could be so dangerous? For all the benefits of electronic docu- mentation, EHRs can easily byte us in the emoticon and land us smack in the middle of a medical practice claim if we're not careful to sidestep these 5 pitfalls. Auto-populating fields. We've all heard of "Not charted, not done." 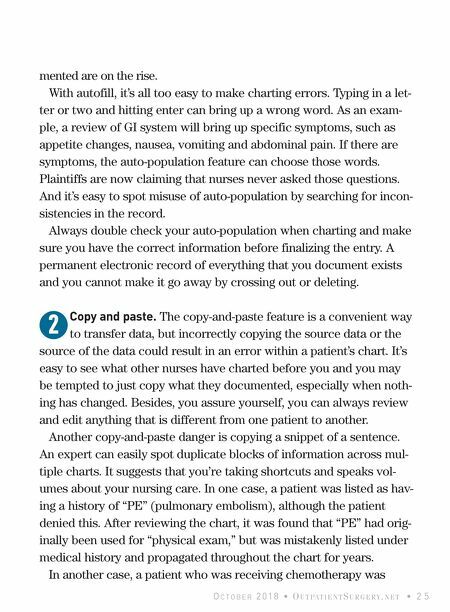 The ultra-convenient auto-fill/auto-population feature on EHRs has inspired a new charting maxim: "Charted, but not done." 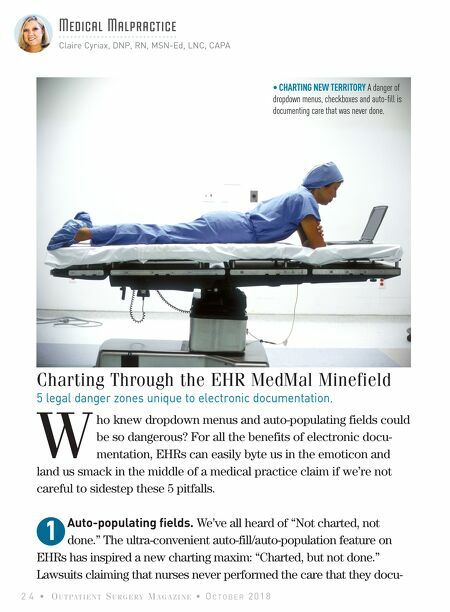 Lawsuits claiming that nurses never performed the care that they docu- 1 Charting Through the EHR MedMal Minefield 5 legal danger zones unique to electronic documentation. Medical Malpractice Claire Cyriax, DNP, RN, MSN-Ed, LNC, CAPA • CHARTING NEW TERRITORY A danger of dropdown menus, checkboxes and auto-fill is documenting care that was never done.